This little nest makes me happy. Can you see the little bird fuzz top left? It's sad. So sad. It's a sad, sad situation. Sorry seams to be the hardest word. I'm sorry, very very sorry. I'm sorry I was smug. Very smug. So very smug. So very very smug. So smug that I did not cover my beloved hydrangeas and hostas during the hard freeze warning. I was smug because there had already been 3 or 4 freezes and my babies had made it through just fine - which made me even smugger. 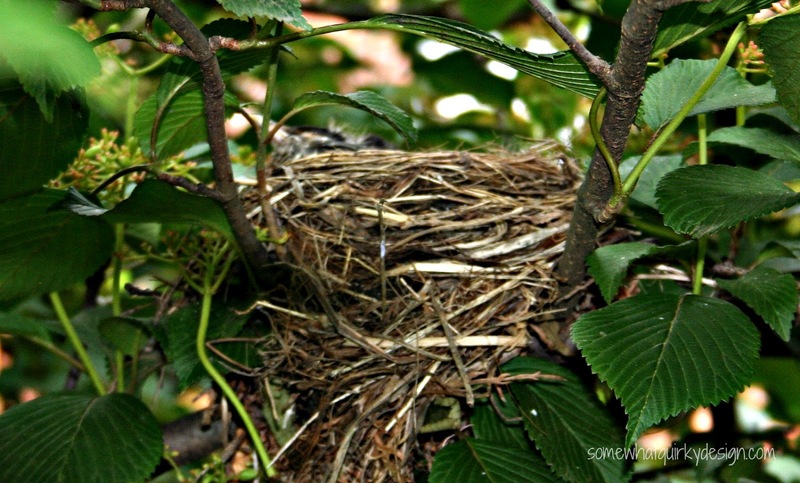 You see, we had this early spring in my neighborhood and all my babies came up early. Everything was at least 6 weeks ahead of schedule. 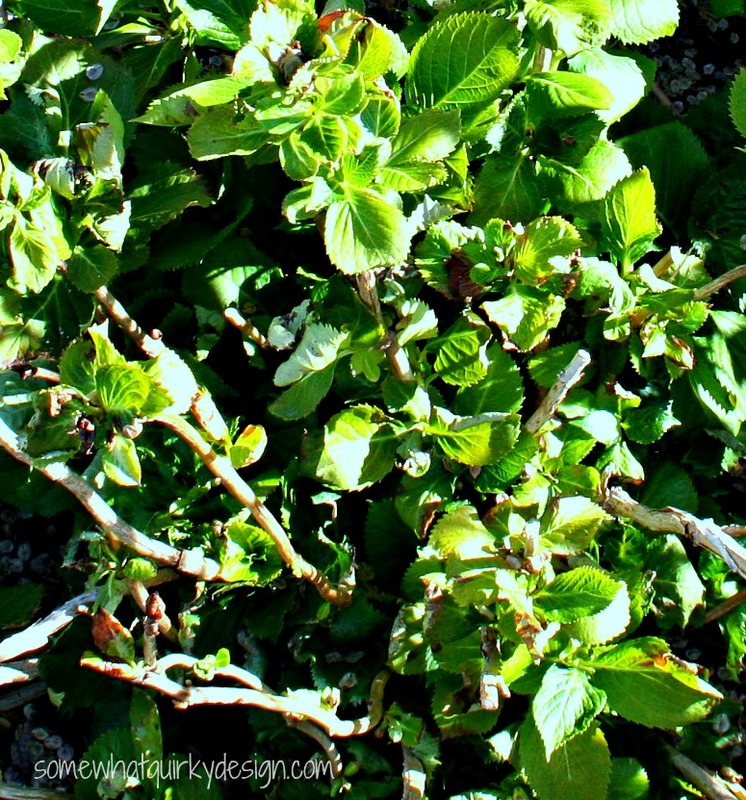 My hydrangeas were heavily leafed out, and the hostas which would normally just be 4 inches tall and tightly wound were a foot tall and wide open with leaves already 8 inches wide. I was a little worried - because I knew it could happen. But it kept not happening - so I worried a little less. And besides, I have like 35 hostas and I'm not sure how I would cover them all. I have 9 hydrangeas and I'm not sure how I would cover all of them either. That's like practically my whole back garden. I don't even know if I have that many sheets. Besides that - I was smug. Now I am no longer smug. I am sad. Sad that ALL BUT ONE of my hydrangeas and more than half of my hostas were significantly damaged by frost early last week. I've been telling them I'm sorry every day since. This is my Lady In Red.. It is an early blooming lacecap. It got the most damaged. This is my Blushing Bride. 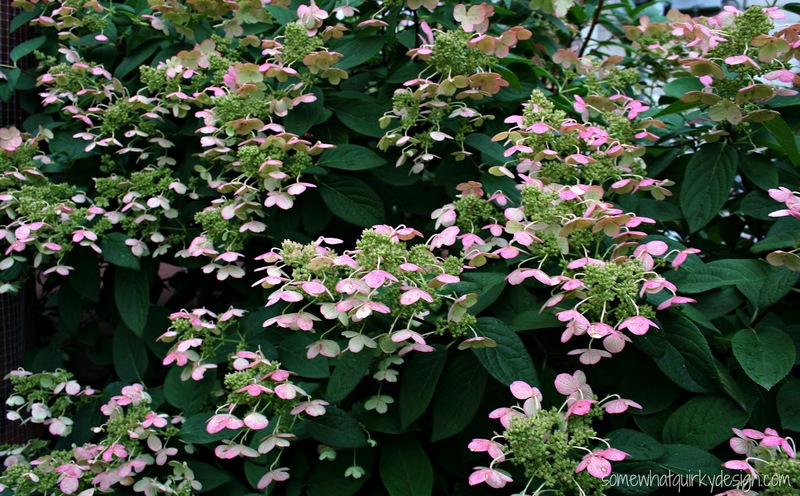 It makes beautiful white blooms with a slight tint of pink - like it's blushing. It blooms all summer and the blooms dry beautifully. Most of the damage was on the old wood. This is my Glowing Embers. My favorite. 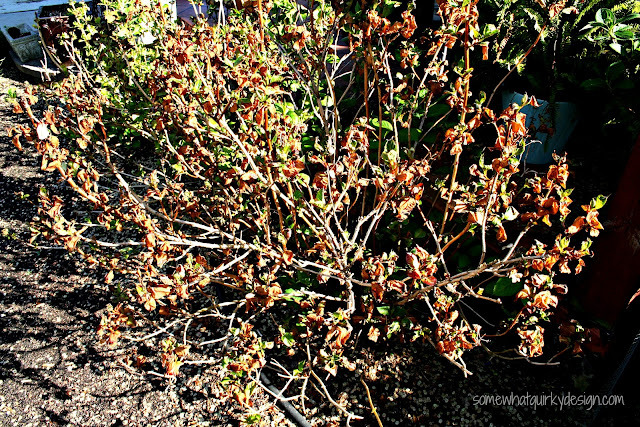 The blooms start out pink and transition to a multi-colored blossom that looks like - guess what - a glowing ember. I won't bore you with any more hydrangea pictures, because I want to morn over my hostas. But first, in case you have the same problem I will tell you the prognosis and the treatment for the hydrangeas. The plant is not dead unless there is not new growth in the center. If you are a hydrangea grower, you know what I mean. Most of the worst damage was on the old wood. Give the plant a few weeks to recover. Then you can cut back everything you feel like is damaged beyond repair. Also go ahead and remove any old wood that is older than three years old. This wasn't too painful, because it helped get rid of so much damage. Each of these plants ended up getting cut back by 1/2 at least - so the pile of trimmings was pretty shocking. The two large hostas here with the piles of leaves behind them are 5 year old Sum & Substance. The leaves are now from 6 to 10 inches across in full growth. 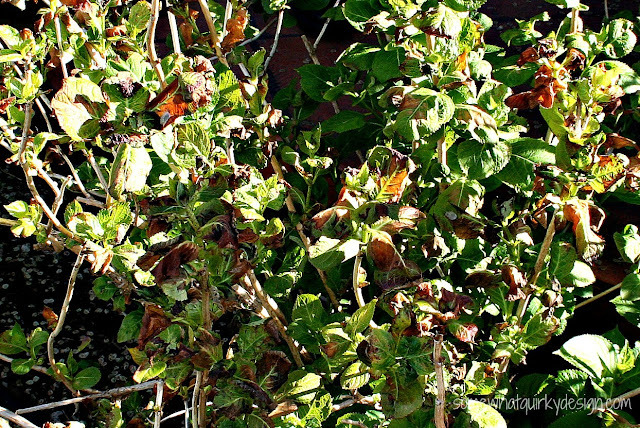 The damaged leaves must be removed because the damaged leaves leave the plant vulnerable to disease. This picture just isn't good - but you can see the damage on the tips of the leaves in the piles bottom left. 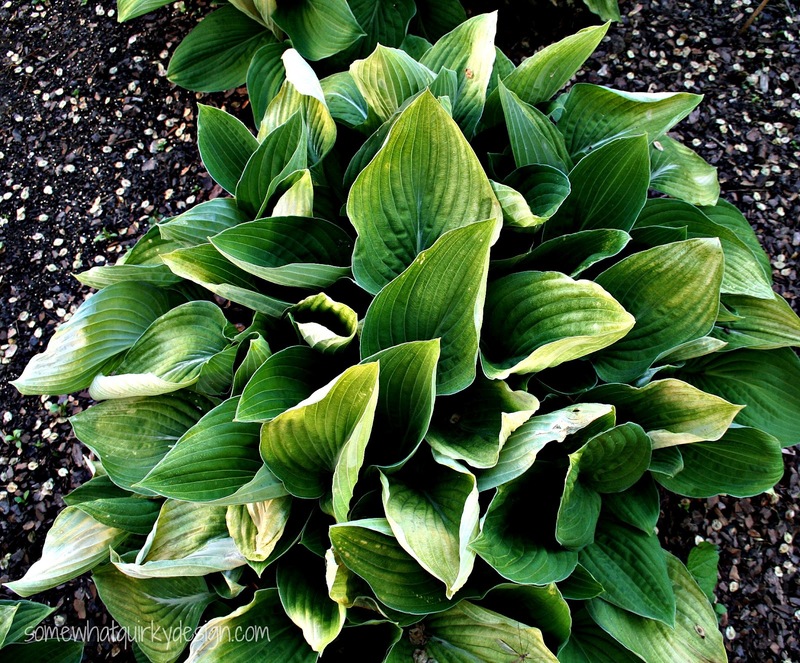 This is what I call an "ordinary" hosta - don't know the name but they are just common run-of-the-mill hostas. You can see the damage - all of the leaves that look faded are the ones that are damaged. I haven't had a chance to trim these . 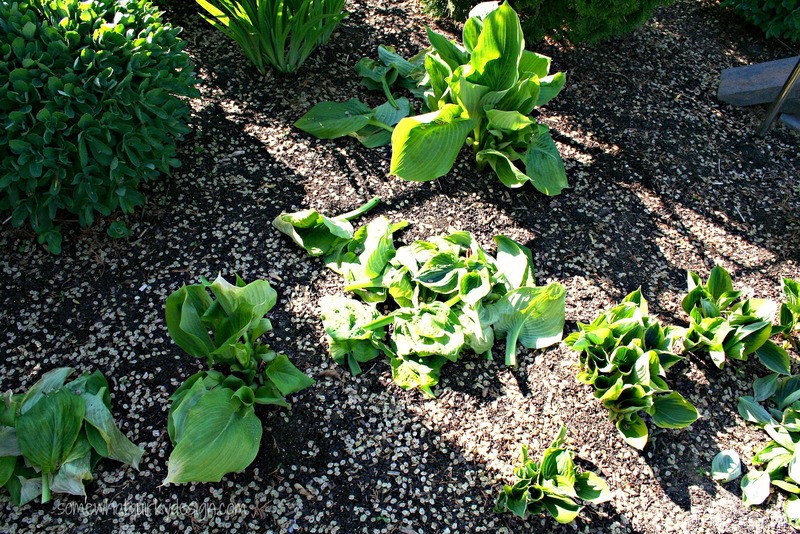 The best I can tell from my research is that all the damaged hostas will be fine. They just won't be as plush as early as they would have. Fortunately only about 1/3 of the hostas were damaged. I'm happy about that - not sad. 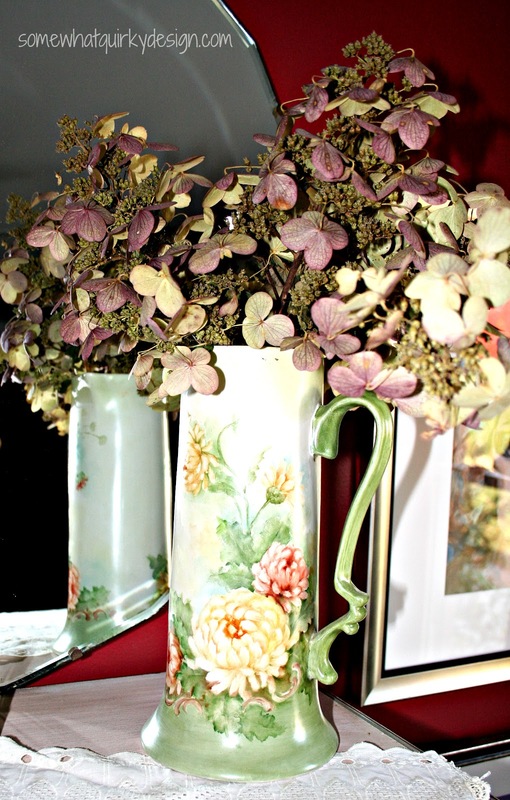 The hydrangeas are still a story to be told. There's almost no way that Lady in Red is going to bloom. However the stems will still grow red and the leaves have red highlights as they always do. I can live with that. Then I can be smug again. Not sad. Not sorry. You have been good to listen. I feel better already. I will know when I am famous in blogland. When a post like this gets more than 45 page page views! So I thank all 45 of you - from the bottom of my heart! I feel you pain! I have a dozen hostas on the side of my house (variegated) and a dozen hydrangeas along my fence on my side backyard. Oh how Iove them and I would be shedding tears if they were damaged. So sorry for your loss - you'll be smug no more! But then again, I wouldn't have gone thru the trouble of protecting them even though we had the same freaky early spring and then frost - I think my gals were spared. Oh no! 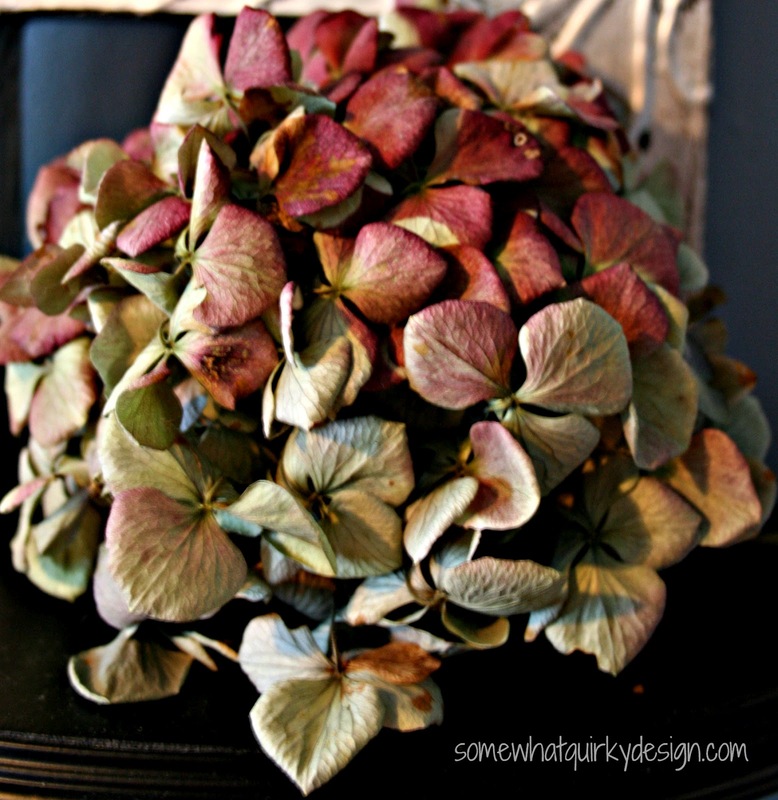 We have 4 hydrangeas, and I do love picking them and drying them! And lots of hostas. The 'common' or original is my favorite. Hope to have a lace cap hydrangea some day. I would be sick about it too. I have been smug and lucky more times than I care to recall. Then after all danger of frost had passed, along came the dreaded softball size hall. Shredded my poor world of hostas to the core. Had to look at them all peeled and splintered, it was sad... very sad indeed. So sorry that you had such frost damage. We had heavy frost the past 3 nights, and my new little transplanted hostas got zapped. Just found your blog, and I am now following you. Oh I am sorry! That is sad,...so, so sad. 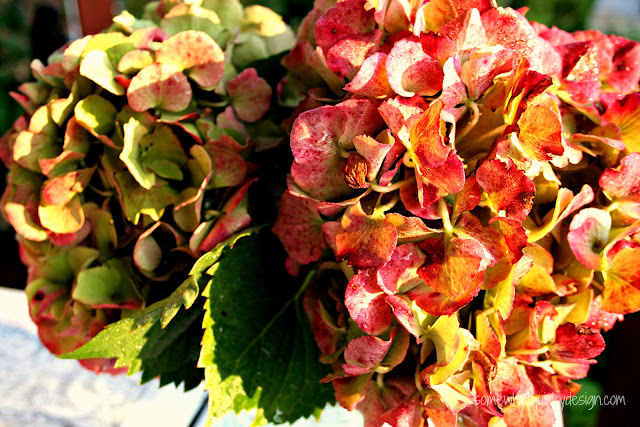 :( Great info to know about hydrangeas. I didn't know that! Thanks for linking it up! It will remind me to cover mine. We are supposed to have a freeze this week! Can you believe it?! It's the middle of May!